Chamber Clean. 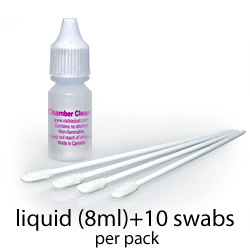 Swabs and liquid for chamber cleaning. Chamber Clean™ solution is filtered to less than 0.2 micron, 40 times smaller than 8 micron pixel size. Visible Dust does not recommend using other cleaning solutions which may contaminate the sensor.